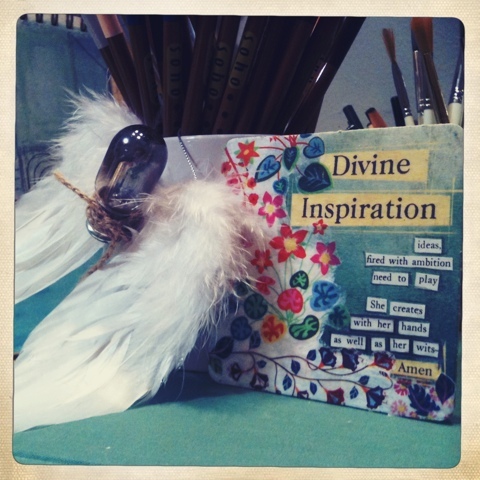 angel wing ornament, found light bulb, decoupaged coaster & found text...as always, the perfect text found me. Apparently, ideas come from cocktail napkins, old journals, mysterious computer files, smart phone notes and random bits of paper. I just spent the last several hours sorting through scribbled notes to pull together every creative idea that I've written down over the last couple years. Ideas for art pieces, new mediums to try, techniques to explore, crafts to sell, articles to write, art series to develop, workshops to teach and creative business plans- they are all accounted for. Phew! Some of the ideas I don't remember writing. Others I could kick myself for not starting sooner because they are so juicy. It turns out that my Creative Bucket List and Letter to My Future Self were just scratching at the surface of projects I want to dive into. This is proving, once again, that I'm a dreamer way way way before I'm a doer. I've been functioning this way since I was a little girl, getting great ideas, writing them down and forgetting about them as soon as the next idea comes along. I seriously frustrate myself. Does anyone else have this problem? I'm not going to dwell on it too much as I've made quite a turn-around since last summer, but what is it going to take this year to turn more of my plans into action? Can you tell I'm on an organizing streak? My inner critic is trying to guilt me into thinking that I'm just using this as an excuse to avoid actually making art. I realize that's how it may seem, but I know better. I have purposely been taking advantage of the calm before the storm. This is my time to get organized so that when work gets back into full swing this coming week, I have my creative artillery ready. I totally understand what yo mean by all these ideas you forget about. I am the queen of post-it notes. They seem to multiply like rabbits. I have stacks of them. Many of them will have a quote I loved followed by some ideas and projects. I love the idea of making a master list and eliminating the mental clutter.